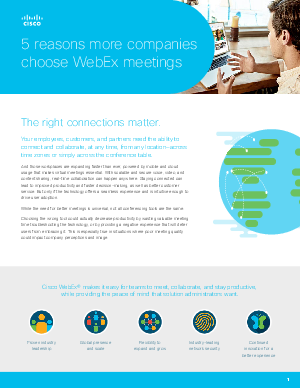 Your employees, customers, and partners need the ability to connect and collaborate, at any time, from any location—across time zones or simply across the conference table. And those workplaces are expanding faster than ever, powered by mobile and cloud usage that makes virtual meetings essential. With scalable and secure voice, video, and content sharing, real-time collaboration can happen anywhere. Staying connected can lead to improved productivity and faster decision-making, as well as better customer service. But only if the technology offers a seamless experience and is intuitive enough to drive user adoption. While the need for better meetings is universal, not all conferencing tools are the same. Choosing the wrong tool could actually decrease productivity by wasting valuable meeting time troubleshooting the technology, or by providing a negative experience that will deter users from embracing it. This is especially true in situations where poor meeting quality could impact company perceptions and image.